1. Think about what you want to do. Get the options crystal clear in your mind. 3. Toss a coin. As you observe how it falls, check your gut feelings. Do you feel pleased, or do you wish you hadn’t made the toss? This will tell you which way you REALLY want to go (and you are absolutely NOT bound by the fall of the coin). 4. Pray, meditate, seek inspiration. 5. Make a list of the pros and cons of BOTH taking the action you are considering and of NOT taking that actions. Include your positive and negative feelings about the decision as pros or cons. Weight the balance. 7. If you need more information, do research on the Internet or at a library. 9. Create a decision tree. This involves asking yes-or-no questions at every point. For example, the first question might be: Do I want to make this change? Then: Am I willing to make the effort to make the change? And so down the tree until a final decision, usually something about timing and resources, is answered. 10. Lastly check back over the decision tree again. At every point of decision, check the relevant decisions and actions and weigh them against your gut feelings, your values, your purpose and your vision. Only if all of these are in agreement with the decision you are inclined to make should you move forward. One last suggestion… never forget the importance of #5. Always include the pluses and minuses of NOT making a change, as well as of making that change. Sometimes a craving for the new may lead to impulsively giving up more than you have recognized. Or not. There’s not much difference between fog and a low-flying cloud. Normally one can see some feet ahead, at least one’s hand in front of one’s face. When it comes to smog, though, everything is different. 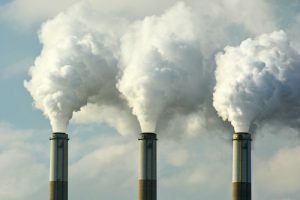 Smog is fog combined with air pollutants. It can incapacitate those with lung problems, and cause lung problems for those who previously did not. It can also get one very, very lost. Although not in London, I was having my first experience of a London pea-souper. Efforts along “clean air” lines have, in much of the world, ended what in London were called “pea soupers” – smog so thick that you can see through it about as well as you can see through pea soup. However, recent attempts to limit or overturn the clean air laws concern me. Let me explain some of my experience with London pea soupers, which, occasionally, would spread 50 to 60 miles beyond the city. The first paragraph, above, involved a time when I was trying to get to choir practice one evening. (I was a teenager, and choir practice at least got me out of the house one evening a week.) The walk usually took less than ten minutes, and I knew the road like the back of my hand… or so I thought. Yet that evening the smog was so thick that I became totally disoriented. Yes, I really did have to feel my way along the fences and hedges that fronted each of my neighbors’ homes. Usually, in the dark of night I could just see where my hand was if it was in front of my face. In this case, in the early evening, I could not. I got to the church – and back – but the experience certainly did not prepare me for what I encountered when I moved to London (one of several cities sometimes referred to as “the big smoke”) a few years later. It happened that I counted among my London friends a number of people for whom cycling was the normal form of transportation and a way of life. I soon learned that, when needed, some of them also served as guides when the London smog was so bad that the drivers of the tall, double-decked London buses could not see the curbs, the road surface lines, or the street signs that usually guided them. As thousands of commuters depended on the buses this was serious business. Because they were nearer the ground than the bus drivers, and did not have reflections from the bus windows to distract their vision, they could just make out the street signs, the road surface signs, and the curbs in even the worst of smogs. they would gather at London Bridge, and each would negotiate with a bus driver for a fee to guide him to his destination. Youngsters who had lived all their lives in the city, they knew the twists and turns, and each would ride ahead following the intended route, pausing occasionally to check with the bus driver to be sure that they were the driver thought they should be. Away from the smogs, cyclists and bus drivers were hardly the best of friends, but in times of need they cooperated so that the buses and their impatient passengers got to their destinations, usually more than a little late, but they got there. 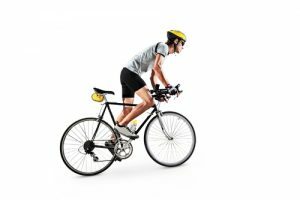 Meanwhile the cyclists, most of them chronically short of cash, benefited in that way. It sounds ridiculous now, but it happened. Even more surreal was an incident involving the fire engine (as they are known in the U.K.). I was, very cautiously, walking from the Underground (subway) station to my nearby home after work. I heard the fire-siren behind me, approaching unusually slowly. A few moments later I saw a glow approaching. It turned out to surround a flaming torch held aloft by a man running along the white line in the middle of the road. Behind it, guided by the glow, was a fire engine on its way to a fire emergency, travelling only as fast as the man could run. As I wondered where the fire was, the vehicle stopped. The runner mounted the steps to a house to peer at the street number on the door. Having discovered how far along the road they were, and so how far they had yet to go, he returned to the white line and continued his journey, cautiously followed by the fire engine. I never did discover whether they got to the fire in time to save the house, or any lives. Of course that happened many years ago. Today, our GPS systems would let us know how far along our journey we were, how far remained, and where to turn, should smogs occur again. We would not have to rely on a running man with a flaming torch. What, though, would warn us of that other vehicle approaching from the other direction as each of us tried to rely on the hardly visible street signs, curb sides and surface signs? Let us hope that the “clean air” laws will survive efforts to dilute them, so that we will never again have to put that thought to the test. 1. Take responsibility for the choices that led you to cause the pain (or harm). Accept that, regardless of your reasons for doing whatever you did, it was your actions or words that caused pain for someone else. No excuses. 2. Search your heart to be sure that it is the pain or harm caused to the other person that you regret, not just your experience of your own consequences for causing it. 3. Understand that, however much you want to explain, and however much the other person wants to know why, once they know, the hurt will not change. Their feelings towards you may change, but don’t count on it. The hurt will still be the hurt. *Why* is very rarely a useful question, and explanations often sound painfully like self-serving rationalizations. 4. Decide what you need to do, how you need to change, to ensure that you do not ever again make that kind of choice, and so cause others more pain. Make those changes in yourself. Until you have learned the lesson and sincerely attempted to make the changes it is unreasonable to expect that the human heart will truly be able to forgive you, and it is questionable as to whether it should. 5. Plan how you will communicate with the person(s) you have hurt. Do you need to prepare them with a letter or a third-party communication? You need to let them know that they need no longer fear hurt from you. You also need to be absolutely sure that this is true. Do not just turn up on someone’s doorstep or confront them unexpectedly. 6. Be clear in your mind that, IF an apology is best for the person, you will make it without excuses and rationalizations. 7. Decide what could or should be done to make amends to the person(s) that you hurt. This will be in addition to the apology, if one should be made. 8. Examine carefully whether making amends will indeed be helpful to the other person. We are not considering your comfort here. To make amends might make you feel better but at the same time may re-open yet again the other person’s old wounds. You would do well to consult with another person, someone of wisdom, on this. 9. Make the apology, offer the amends, with no strings attached. Forgiving you is NOT the same thing as returning to old situations and/or making it possible for you to repeat the behavior. Do not count on a return to a previous relationship as a part of the forgiveness. 10. If the individual wants no part of your apology or your making of amends, be prepared to accept this too. If that hurts, do not turn the pain into anger against them. They may need more time to heal. Know then that you have done the best you can do, and plan on how you can use the process you have gone through for your own growth and the lessening of pain among other people. How do you feel about coincidences? Some people ignore them. Some see them as relating to some mysterious or divine force. Others seek a logical explanation. Some seek logical explanations so eagerly that they invent them, sometimes fairly wildly. One of the satisfying things about many television programs, detective stories, and the like is that by the end of them, all the things that had seemed to be random and unrelated actually come together. They make sense, and we do like things that make sense, don’t we? Randomness is less welcome.It leaves us feeling uncertain of what may come next, or of what we should do. There are no signposts in randomness. Coincidence seems to be first cousin to randomness, and so when we encounter it we often try to find ways to explain it. One of the most common explanations is “It’s a small world,” words frequently spoken when, far from home, we encounter someone from our hometown or find that we have something else in common that we would not have expected. Those “small world” coincidences occur so frequently in my life that I even bought the domain name “ItReallyIsASmallWorld.com,” although I’ve not yet done anything with it. Randomness is sufficiently scary that, when apparent coincidences occur, we tend to look for reasons. We expect there to be a pattern, a cause, and our brains are wired to look for them. Suppose, for example, that you were to do one of those memory word tests. Let us say that many words were presented in apparently random order and reordered and repeated several times. Suppose, too, that they include, for example, the words eggs, bacon, saucer, tree, timer, and lion, plus quite a few others. Then, after many repetitions, you might be asked how many times you heard “eggs” immediately followed by “bacon,” and then how many times you heard “timer” followed by “lion.” Almost certainly you would have noticed the eggs/bacon combination, because it is familiar and it makes sense. Unless you are a vegetarian/vegan, the word “eggs” is frequently followed by “bacon.” On the other hand, unless you were very alert it is much less likely that you would have noticed the timer/lion combination because they don’t intuitively go together as a familiar pattern. (Interestingly, if it was “lion” that came first, followed by “timer” you might have noticed it, and wryly wondered if the word “timer” was meant to be “tamer,” because there is logic to “lion tamer.” From then on, you would notice the combination. However, with “timer” coming first, your report of the number of times you heard the timer/lion combinations is likely to be that they did not occur nearly as often as eggs/bacon – even if, in fact, the two pairs appeared together an equal number of times. Why do I care? Because we waste a lot of time looking for patterns that may or may not exist. Sometimes, however, coincidences just happen. Sometimes they can be amazingly fortuitous, and then the religious among us may throw out a “Thank you,” to whatever deity they follow. Indeed, perhaps there really is a are causation that we cannot see. There is saying, “Coincidence happens when God wants to remain anonymous.” Sometimes,on the other hand, we do need to dig deeply to discover connections that may have been hidden and it may turn out to be fortunate that someone was alert enough to notice a pattern that needs to have attention paid to it. When to search and when accept “not knowing” is one of the enigmas of our lives. The fact is that at times coincidence really is exactly that. For example, what did you think about the photo above? Did you struggle to figure out how the router is throwing its line of lights up onto the wall? How does that work? Sorry, it is not doing that. There is no causation between the two sets of lights, similar though they appear. It is a straightforward coincidence… of sorts. I have Venetian blinds over the window in my office. To accommodate the string that hold the slats together and controls them, each slat has a hole, and the holes are exactly in line, vertically. 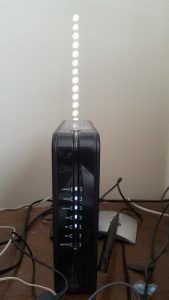 The sun’s shadow often throws a vertical line onto the wall, and one day I noticed they were precisely lined up above the router. Naturally, I grabbed my camera. The lights on the router and the pattern on the wall had no causal connection with each other. None at all. Sometimes, seeking a connection between two apparently separate events makes sense. An earthquake may cause a tsunami many thousands of miles away, and there is a causal connection, although until modern times this may not have been recognized. Sometimes it is fun, and occasionally rewarding, to try to discover why coincidences happen. Often, though, it may be wiser to accept uncertainty than to spend time and energy seeking it for things that do not directly affect us. We have more important work to do…. Don’t we?